What will the final figure look like given that pile of toothpicks? We used a pack of 250 toothpicks and made 12 levels. If we used another 250 toothpicks, how many levels would that make? Write a function t(l) that takes the number of levels (l) and returns the total number of toothpicks (t) in that pyramid. How many levels can he make with those toothpicks? How long did it actually take to go through the entire stack? How many toothpicks does it take to make the next sized equilateral triangle? 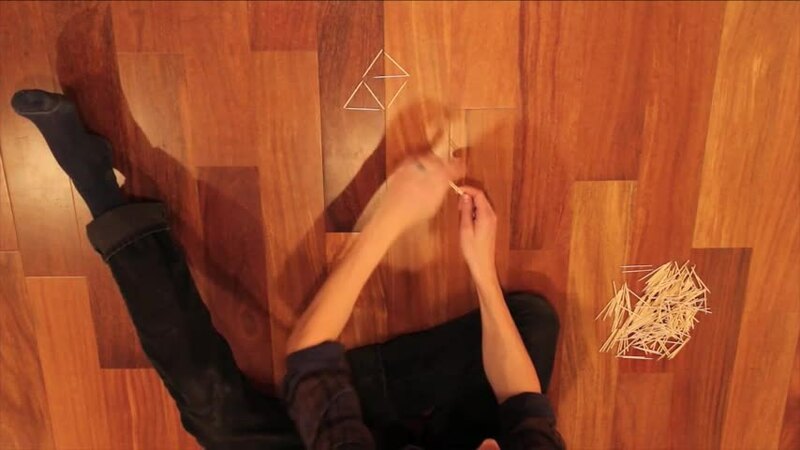 What's the biggest triangle pattern he can make with that many toothpicks? What is the perimeter of the final triangle? How big is the triangle? How many "total" triangles will be created (any size)? How big will the triangle structure get? How many rows was Dan able to complete? How many rows in the end? How many triangles will be made with all those toothpicks? What does the final design look like? How many triangles can you make? How many small (3 toothpick) triangles can be made? How many triangles were you able to form? How many triangles did he make? How big will the toothpick pyramid be? How many small triangles did he make? What is this famously known as? How many more toothpicks are used in subsequent rows? How many triangles did you make? How much area does the whole pattern cover? Each row adds a number of triangles. What is the pattern of how many triangles are added in each row. How long does it take to build the pyrimid? How many triangles did he build? Without counting them, could you be sure there are 250 based on your design? How many triangles can you make with 250 toothpicks? How many toothpicks are in the pot? How many triangles were made with n toothpicks? How many rows will the triangle be? How many triangles or rows did they make? Where is the camera mounted? How many levels can I make? How many triangles did he make with the toothpicks? How many rows will he be able to complete with the toothpicks he has? How big will the final product be? How many triangles did she make? how many toothpicks were used? How many triangles will it make? what is the relation between the number of triangles and the number of toothpicks? How many toothpicks are used to build a certain pattern? What does the pattern look like? How big was the final triangle? How many triangles are formed? How many toothpicks are in the container? Why is the toothpick container on the floor? how many cocktails sticks were in the packet? How many triangles can I make from this container of tooth picks. How many rows could you make? How big can the figure get with x number of toothpicks? How many triangles? How many toothpicks? How many layers were made in the pyramid? How big of a triangle can you make? was a completed triangle created? What did the final product look like?!! How many triangles would there be if he used all of the tooth picks? How many triangles were made? How many triangles will you see? What did the final product look like? How many triangles can be built?